There is a certain type of lighting for every area! Garden lighting decorates and makes your house even more beautiful, it can also protect your house (for example, scare uninvited guests off). Wiring outdoor lighting in the garden depends on the electricity supply. You can place the wall lights pointing up or down, on both sides of the window or door. Their coverage will be spotted. Bras are convenient to use due to their small size. The perfect solution is hanging lamps with caps, ceiling lamps or recessed lighting for directional light (IP23). Designate and limit the path leading to the house with columns or low columns placing them every 3-4 meters, to make it absolutely safe to walk on. The usage of solar-powered columns provides the ecological and simple lighting. One can illuminate the crown of the trees with the help of a flashlight or lamps on the ground. Glowing columns can highlight the trees. Spotlights located on the ground level create a special atmosphere in the garden. Because the lights are removable, they do not interfere with mowing the lawn. Use the light bulbs corresponding to the type and power of your lamp. You should know that there are special lamps that do not attract mosquitoes. Streetlights create a special mood with the lighting. Depending on the model, they have from one to four lamps. In accordance with the model, many lamps are equipped with a motion detector that turns the light on, if a person passes by. The motion detector can be connected to some of the lamps. A hanging spotlight with a halogen bulb will be the best solution for you. It is often equipped with a motion detector, which turns on the lighting when a person or a car passes by. Before starting to wire outdoor lighting, carefully prepare the external electric circuit. Whatever your choice is, the main thing is security. You can connect an external electrical power supply to the general switchboard. What protection is the best? At the beginning of the circuit, a differential protection of 30 mA is required. In addition, a new circuit must be protected by one or more switches of the appropriate amperage: 10-16 A for lighting, 20 A for electric circuits and electrical outlets. 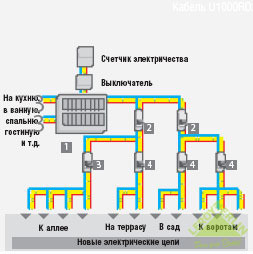 It is useful to divide the electrical circuits if you have a lot of lighting. Make independent circuits for each coverage area. Do not exceed the allowable power values. Electrical connections can be made only within the lighting fixtures, the cables must be buried in the ground. With an automatic control, or without it? Numerous devices are sold with an already built-in motion detector. They come with the photocell that automatically turns the light on at the slightest movement. Your house becomes safer and more convenient. You can integrate a new circuit into the existing circuit using a junction box. How to bury an electrical cable? Burying the wires into the ground meets the strict safety standards. To prevent the effects of the compaction of the earth, the wires should be buried to a depth of at least 60 cm, and if under the carriageway, – to a depth of 1 meter. Before digging a trench, check if there are not any underground cables buried earlier. Underground utilities are indicated with the signal crate: red for electric wires and green for the ones. Mind the minimum distance (20cm between two cables). Pre-plan the installation of external lights, indicate devices, cables and different connections in it. With the help of a shovel, dig a trench to a depth of at least 85 cm, with a width of 25 cm, from the power supply output to the lighting device that is being installed. Pour 15 cm of sand on the bottom of the trench. 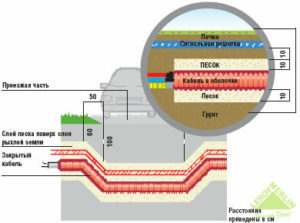 Place a red protective sheath of the electric cable with a diameter of 40 mm along the entire length of the trench (if necessary, you can use the couplings). With the help of the driver threads, insert and route the cable U1000 R2V of the desired length across the shell (up to 1.5-3 mm2 to 2200 Watts and 2.5-3 mm2 to 3600 Watts). You have to be sure that you will be able to re-stretch the cable after the installation of communications. To do this, firmly attach the cable to the end of the shell and seal it with tape. Pour 10 cm of sand. Put the red signal crate along the length of the trench. Put down the plan of the trenches, in order to make changes if necessary. The lamps should be firmly fixed on the ground, preferably on the concrete foundation. First, make the output of the sheath and cable, and then pour the concrete. How to illuminate the edge of the pool? If you have a trampoline, then zone 1 extends to a height of 2.5 m above the trampoline. The installation of external lighting can change your level of electricity consumption if you exceed the amount of power provided by the utilities. To find it out, add up the total amount of capacity of new lamps and conventional power. In any case, consult your electricity supplier. Zone 1. All the lighting devices are prohibited, except for the devices with the very low voltage of 12 V.
Zone 2. All the lighting devices of class 2 shall be equipped with a differential residual current device, as well as the devices with the very low voltage of 12 V.
All the provided information has only a recommendation character. For installation, connection and maintenance of electrical appliances and/or circuits refer only to the professionals, who have undergone appropriate training and have access to such works.